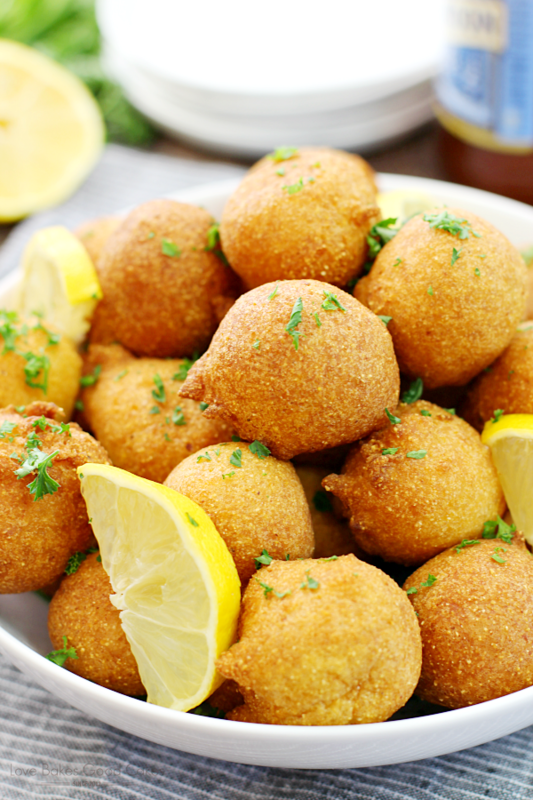 Classic Hushpuppies are the perfect accompaniment to your fish fry! They come together quickly – and disappear just as fast! Everyone loves them so much that you might want to double the batch! Southern food makes me happy. There’s just something special about it that conjures up so many good memories. It reminds me of days gone-by with family, great food, and lots and lots of smiles and laughter. It reminds me of a more laid-back time in my life … where things were more carefree and life was simple. Ahhhhh …. to go back to those days!! Not only does Southern food make me happy, but I get ecstatic when I see my friends following and reaching their dreams!! My friend, Melissa Sperka of Melissa’s Southern Style Kitchen, just realeased her first cookbook – Melissa’s Southern Cookbook: Tried-and-True Family Recipes! I couldn’t be more delighted for her and I was super excited to get my hands on a copy! Y’all, it is FULL of great Southern food and I have soooo many of the recipes bookmarked so I can try them! Inside, you’ll find Southern classics like Homemade Pimiento Cheese, Classic Hushpuppies (which I am sharing with y’all today! 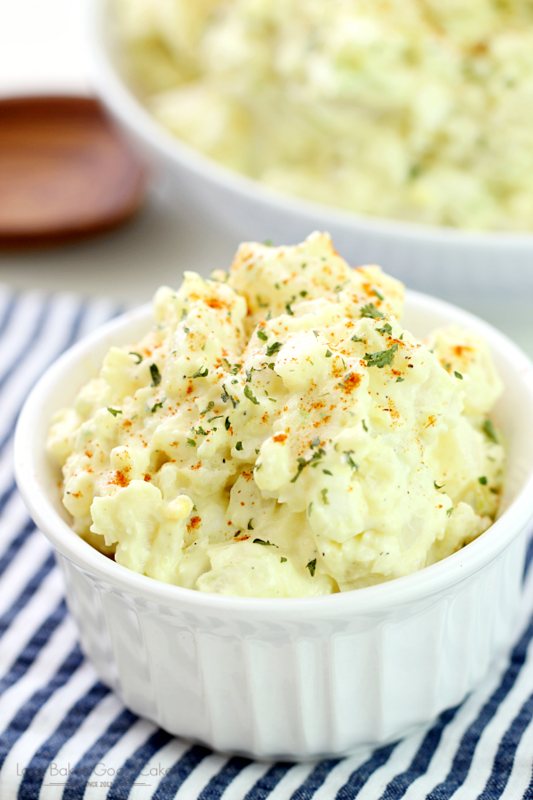 ), Green Beans and Red Potatoes with Vidalia Onion and Bacon, and Old-Fashioned Peach Cobbler …… along with some updated twists like Cajun Crab Dip with Garlic-Herb Roll Dippers, BLT Macaroni Salad, Cheesy Bacon Ranch Chicken Spaghetti, and Mississippi Mud Brownies!! 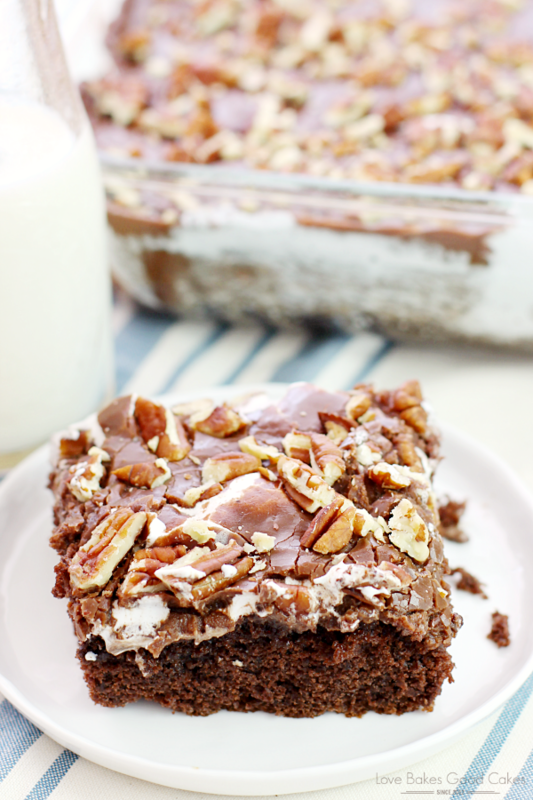 My tastebuds are swooning, y’all ……. The Classic Hushpuppies caught my eye because 1. 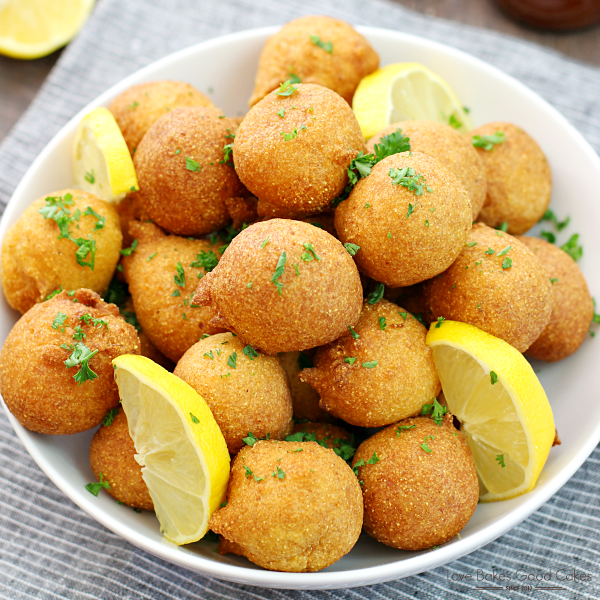 I have been wanting to make hushpuppies for awhile and 2. They’re right there on the front cover just begging to be made. 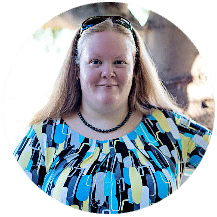 I really had no choice – it was almost like destiny! 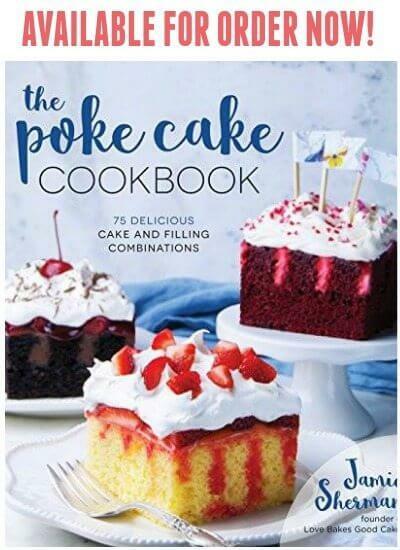 This is a cookbook you need to have in your collection – you will be turning to again and again! 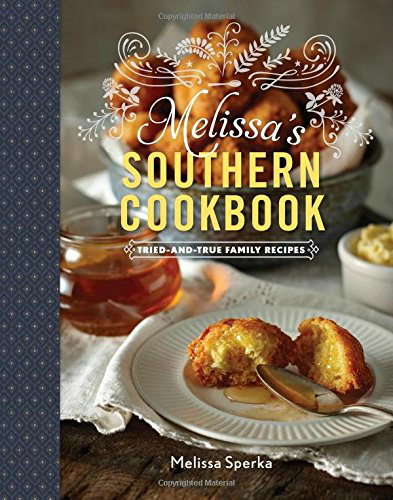 Melissa’s Southern Cookbook: Tried-and-True Family Recipes also makes a great gift for the cooks and foodies in your life! Before you go, be sure to enter the giveaway below – you have the opportunity to win a copy of Melissa’s Southern Cookbook: Tried-and-True Family Recipes! You can enter as many or as few options as you like – Good luck, friends! Please note: Giveaway ends 6/10/16 at 12am Eastern time. This contest is open to US residents only. You must be 18 years or older to enter. The winner will be notified via email and will have 48 hours to respond or a new winner will be chosen. 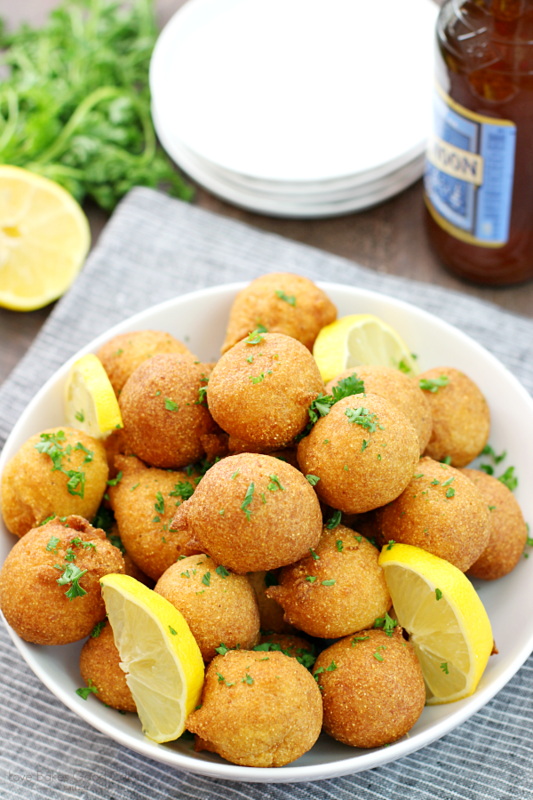 Classic Hushpuppies are the perfect accompaniment to your fish fry! They come together quickly - and disappear just as fast! Everyone loves them so much that you might want to double the batch! Sift together the cornmeal, flour, sugar, baking powder, baking soda, seafood seasoning, salt, granulated garlic, and onion powder. In a separate bowl whisk together the egg and buttermilk. Add the buttermilk mixture to the dry ingredients, and then stir in the onion. Mix until fully moistened. Allow the batter to rest on the counter while the oil heats. In a large deep pot, heat 4-inches of oil to 350°F. Using a tablespoon or a 2-ounce ice-cream scoop to divide the batter, fry in batches, carefully dropping the batter into the hot oil. Cook around 4 minutes, turning as needed for even browning. Transfer with a slotted spoon to paper towels to drain. Season the hushpuppies lightly with additional seafood seasoning immediately after removing from the oil. Keep warm in a 250°F oven between batches, if desired. 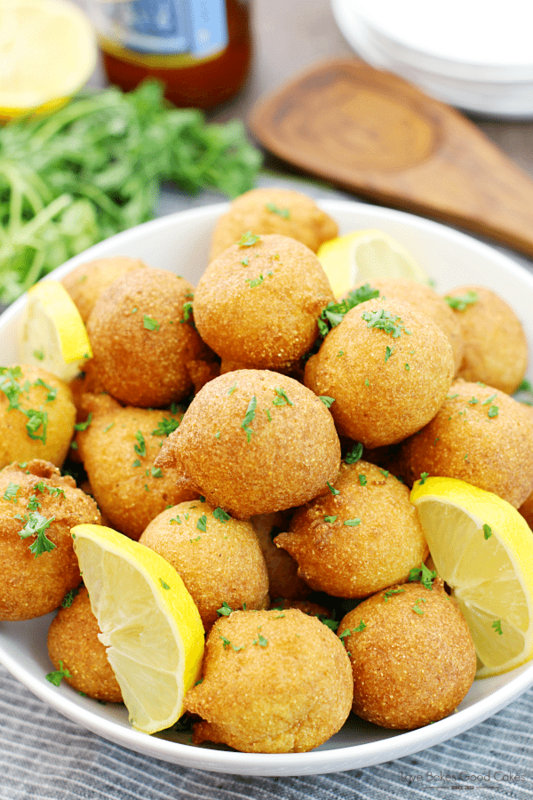 Serve the hushpuppies warm as is or with a side of butter and a drizzle of honey. Jamie, my mouth is watering! These looks delicious! 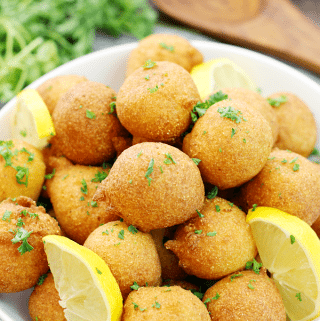 Hushpuppies are such a southern classic dish that you've got to have on the table for friends when they come over. I need to try these. I bet they'd be a big hit, yum! I love a good creamy mac and cheese! I can't wait to make these! Thanks for the chance for the cookbook. 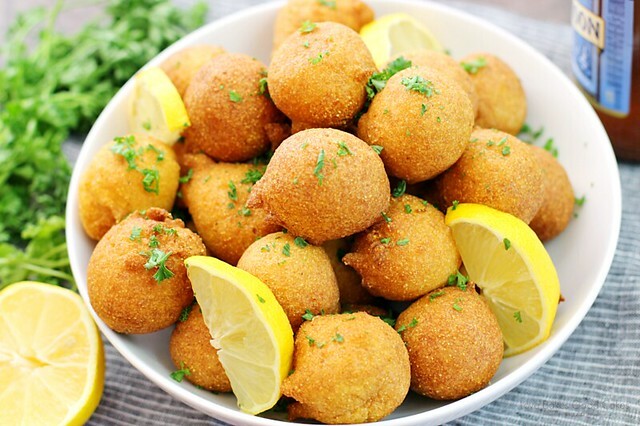 I've never had hushpuppies, but I NEED TO!!! These look delicious, Jamie, and they'd be so perfect with some delicious fish! What type of seafood seasoning ?